Dave Roberts has been pretty good in his first season as manager, but the way he managed the game on Tuesday nearly cost the Dodgers their season. That’s probably an oversimplification, but Roberts did not have a good day managing, and it began and ended with his handling of Clayton Kershaw. I was on record saying I’d have started Julio Urias instead of Kershaw, but it wasn’t that big a deal. After a shaky start to the game, the Dodgers getting five innings out of Kershaw would have been great news. So, his getting through six innings was miraculous. Conventional wisdom said the Dodgers should have quit while they were ahead, but Roberts didn’t see it that way. Pull Kershaw. Did his job on short rest. Again. Coming off three days of rest and the herniated disc that caused him to miss 2 1/2 months of the season, lifting him was a no-brainer. 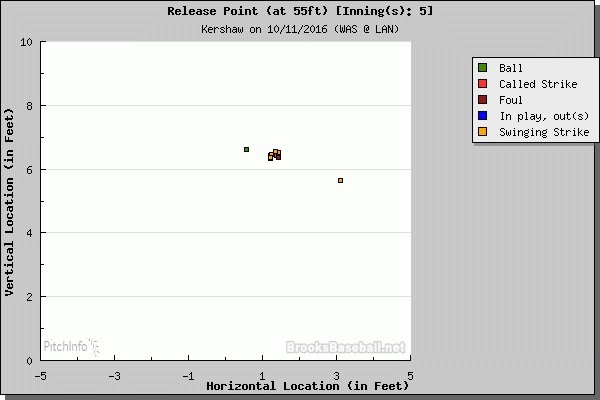 Instead, Kershaw was allowed to hit for himself, and he drew a walk but did not score. After he hit for himself, you knew he was coming out for the bottom half of the inning to pitch. Kershaw was at 89 pitches through six innings (5 hits, 2 runs, 1 walk, 11 strikeouts), but more than a raw pitch count or his performance, his command had begun to waver and he was giving up some loud contact. 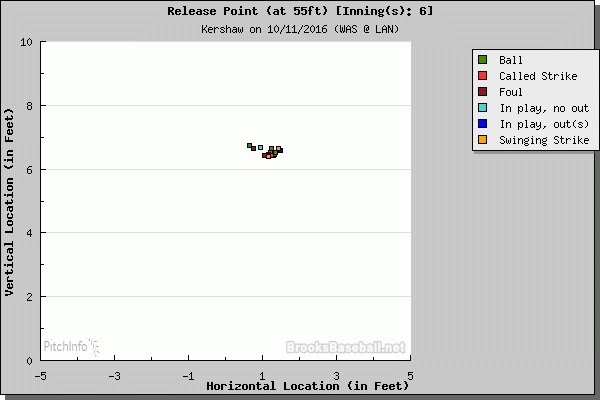 And as you can see, his release point started to become inconsistent, which is a clear sign of fatigue. The thing that appeared to keep him in the game was that he facing the bottom of the Nats’ lineup, including Danny Espinosa, whom he had struck out in five consecutive plate appearances dating back to Game 1. Naturally, Espinosa lined the first pitch he saw from Kershaw in the seventh for a single. Going back to the sixth, Kershaw allowed exit velocities of 95 MPH (Jayson Werth), 102 MPH (Daniel Murphy) and 99 MPH (Anthony Rendon) before Espinosa’s 103 MPH single in the seventh. With a 3-run lead, pulling Kershaw after the first runner got on would have been acceptable, but Pedro Baez was not yet ready (also on Roberts, despite sending Kershaw out for the seventh). Pedro Severino struck out and Chris Heisey flied out, but he barreled the ball and just missed hitting one a lot further than medium-deep left center. 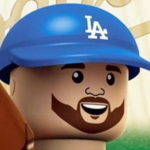 Kershaw then wasn’t helped by his defense as Corey Seager couldn’t get the ball out of his glove to force Espinosa at second base and the mess was officially on. Then came the epic showdown with Bryce Harper. It was some good baseball, but it probably shouldn’t have happened. After a long meeting on the mound where it seemed like Kershaw convinced Roberts to let him remain in the game, Kershaw got ahead 1-2 and had a couple borderline pitches not go his way before issuing a walk to Harper. That was the end of Kershaw’s day — four or five batters too late. Who should relieve Kershaw in this scenario? Well, this is probably going to shock you, but I wasn’t overly offended he decided to bring in Baez instead of a guy like Joe Blanton or even Kenley Jansen. Both Baez (33 pitches) and Blanton (35 pitches) worked a lot the day before, but this was going to be a short outing for whoever was tabbed to pitch and Baez isn’t actually the worst choice to matchup with the right-handed Werth. Unfortunately, instead of shutting down Werth by feeding him high-90s fastballs, he hit him with the first pitch to force home a run. OK, so now it’s 5-3, but this game is still plenty winnable. Instead of going to Grant Dayton, Luis Avilan was brought in to pitch to Murphy. Honestly, he could have brought in prime Billy Wagner and Murphy was probably going to tie the game, but it didn’t make a lot of sense to at least try to put the better reliever in. Avilan did strike Murphy out the day before, so perhaps that played into Roberts’ decision. Who knows? There was zero margin for error, and it was made. So mad Kershaw was not only allowed to start the 7th, but wasn't pulled earlier. This is on Dave Roberts. Period. And there’s something to be said about this, and Daniel is absolutely right. I'm still mad that we can't use today as a legacy-defining start for Kershaw. It should have been. The frustration when combining factors like that with the reality that the tactical moves themselves made no sense was just infuriating. There was always a strong argument to be made for giving the bullpen a fresh inning, which would obviously have involved pulling Kershaw after six. If that happens, odds are whatever combination pitchers in the seventh probably get through unscathed, especially after seeing how Blanton shut the Nationals down for four outs without any sweat. Plus, all non-Jansen relievers had allowed merely one run in 13 1/3 innings before today in series. But Roberts not going to his best relievers with nine outs left in a must-win game nearly cost his club the season, and was just plain confusing since he showed more willingness to be aggressive with the best relievers even during the regular season. It’s hard to understand what exactly he was thinking, especially since it doesn’t seem like many people asked him about it after the game since the Dodgers thankfully did eventually pull out the win. Not sure if Roberts just choked or what, but here’s hoping Roberts uses this as a learning experience. It’s easy to be an armchair manager, sure, but this wasn’t just one bad decision, it was an epic cluster of bad decisions that many called out before things went south and it almost cost the Dodgers their season. Anyway, I’m glad the Dodgers are playing a deciding Game 5 tomorrow, but it almost didn’t happen, and the only reason they are is because the players did just enough to pick up their manager. Circling back to an earlier tweet, especially since Roberts isn’t going anywhere, we just have to hope he takes this advice to heart. Shoddy tactical decision-making happens to the best of them, but this was something that has to end with a lesson being learned, because it simply cannot happen again.